Todays gym stack was deep! I tried new isht, old isht, and doubled up on testosterone boosters. 50+ grams of protein and 6 grams of creatine are great when trying to add mass. Hell add more if you feel like it. Just remember your body only absorbs x amount of any supplement depending on multiple factors. Don’t let ignorant people tell you otherwise. Protein and creatine alone can change your life. Your workouts will yield better fruit. And hey if you are reading this, you want results. And if you are working out you want results. As for the N.O. Fury its a pretty sweet Nitric oxide booster aka- useful pre workout. It is pill form requiring 3 pills, so some people may hate that but it isn’t too bad. I will say it takes the longest to kick in of any pre workout I’ve tried. And my results were good yes, but I was super pumped on the rest of my line up. At this point I know that my blitzkrieg of supplements is working. And the constant mixing is working well. Not many people like to veer away from one brand but I find it fun and exciting. It is also useful to see if certain supps work better than others. N.O. Fury for instance is from Muscletechs cheaper Six Star line but it does work. Yet my Experience with Maniac by AI Sports Nutrition alone has shown me a lot. In essence that great companies are making great products. One serving of Six Star Testosterone Booster. Six star is impressive in the sense that even if you took it for its vitamins you’d win. It is a low cost boost and can/should be considered by all bodybuilders. Overall folks I’m trying everything. A lot of brands “pixie dust.” And a lot don’t. So I will sort through them and bring you the truth! This entry was posted in Supplements, Supplements and tagged #getbrolic, @latinscientists, body building, creatine, eas, muscletech, n.o. 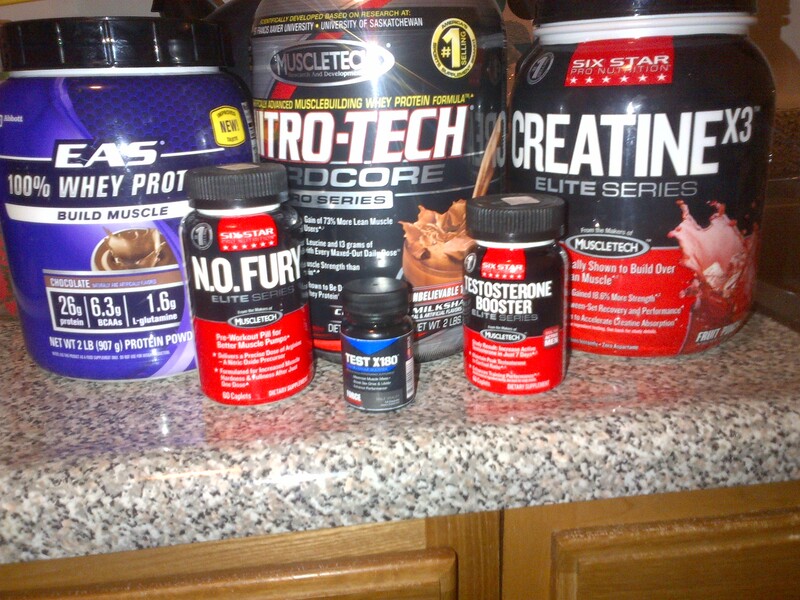 fury, nitric oxide, protein, six star, supplements, test x180, weight lifting, weightlifting. Bookmark the permalink.